Some books are something of a family effort. I wrote Collecting Observer Books and took the photos; my sister drew the cartoons and her partner typeset it using computer technology. It was printed in a run of 1500, bound in laminated boards, by Smith Settle, printers of The Observer’s Book of Observer’s Books and The Observer’s Book of Wayside and Woodland, which were published by Peregrine Books as numbers 99 and 100 in the series. Between 1937 and 1982, Warne issued 98 titles. Up to number 80 they were bound in plain boards and sported dust jackets; my own book conforms to the style of the later Observers. It is an information guide, (not a price guide), listing first editions, with photographs of all the rare titles to assist visual identification. Certain Observer books are worth a fair bit, strangely enough because the popularity of the series slumped towards the end and some titles, such as World Atlas and Paris, were recalled by Warne and pulped; they are now fetching as much as £100 on the secondhand market. 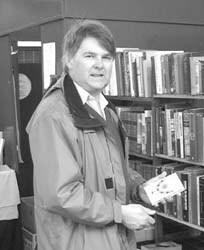 I provide useful information on good hunting grounds – bookshops, book fairs and antiques fairs. Once you have read my book, you will know exactly what comprises a set of Observers and will be able to spot faults and avoid being duped. I explain how to buy and sell them on the internet, how to clean and repair them and how to display your collection to full effect. Curious as it may sound, in my experience collecting Observer books provides a sense of order and purpose. Having said that, it is not without moments of angst. A visitor’s casually remark that your display of books looks lovely can set your teeth on edge if one of the titles you need to complete the set has just eluded you. The main reason people collect Observer books, besides their intrinsic charm, is the thrill of the chase. There’s a real buzz when you find a book after years of hunting. There are about 400 different dustwrappers to collect and after ten years I still have six to find. I really enjoy exchanging anecdotes with fellow collectors and recounting funny tales. The Observer’s Pocket Series Collectors Society (OPSCS ) has over 500 members. We meet most months to swap, sell and buy. 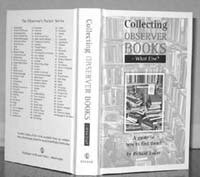 The internet has opened up collecting Observer books to a worldwide audience and they can be posted very cheaply. I sometimes wonder how I will feel when I have accumulated all the books. I don’t know yet. Perhaps it’s better to chase a dream than to fulfil it.